Read here about ring struts, compression members that are shaped like a ring or ellipse. tensegrity structures outlining the form of a ring, see torus. tensegrity structures that can be worn on the hand as a ring, see jewelry . Ring struts are one morphology of strut: others are straight, curved, or nucleated. One way to comprehend ring struts is a bulging straight strut, where the bulge is in one plane only and not omniredial. 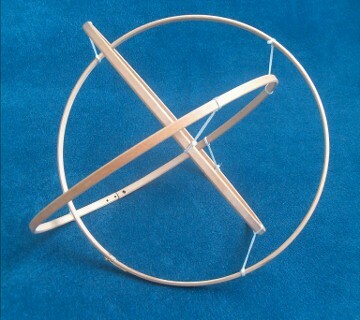 This bulge is inherent to tensegrity: any straight strut under compression will bulge around its middle, like barrel staves straining against their restraining bands. The ring strut expresses in its physical form this distension, but it is contrained to a single plane. 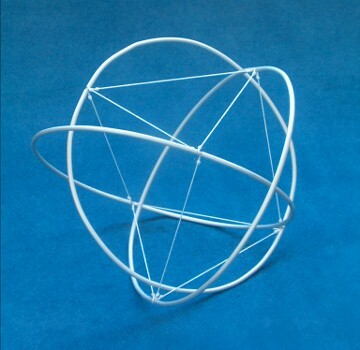 Fuller early on asserted that the ultimate tensegrity is a gravitationally stabilized structure such as the solar system, where the compression elements are round like planets, moons and asteroids. Such a tensegrity has not yet been humanly constructed or modeled, but some explanations of stable crystalls and other material configurations can invoke round compression members. Ring struts are rare; Marcelo Pars has shared a few experiments with this format. 3 ring tensegrity; the tendons outline an octahedron. Construction and photo by Marcelo Pars." 3 ring tensegrity; the six tendons outline an exploded tetrahedron. Construction and photo by Marcelo Pars." See also Strut, Strut, Curved, or Strut, Nucleated. This page was last edited on 17 January 2019, at 07:51.